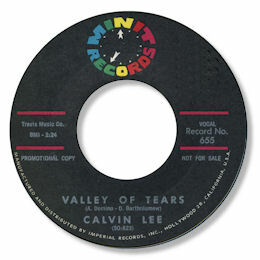 A member of the Del-Royals on Minit, Calvin LeBlanc cut a couple of solo 45s for the same company as Lee Calvin, including a jaunty version of Fats Domino's big hit “Valley Of Tears”. He turned his stage name around for his mid-60s outing on Sansu. The well named "Easy Easy" is just that and is rather better than the frantic "You Got Me". Lee retained this form of address for the world classl ballad Love Is Like Fire (I Just Got Burned), which was leased out to Josie as part of the package that produced the more celebrated Meters singles on the New York based log, even though they surely supply the excellent rhythm here as well. For my money this is a far better release than any of his others, and has long been a favourite of deep soul fans. Even without Allen Toussaint’s name on the single, this was always an unmistakeable New Orleans recording – listen to the way Lee “twangs” words like “learn” and “turn”! 1. The artist on Enrica with the fine deep “Cross My Heart” is Calvin Lee Williams, not our man here. 2. 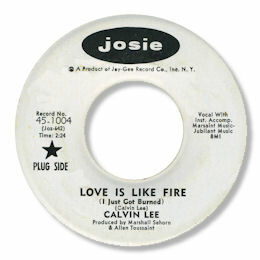 "Love is like fire" can be found on the Grapevine UK CD "Confessing" and "You got me" on "Crescent City Soul Patrol" from the same company.